MOSCOW, August 29. /TASS/. 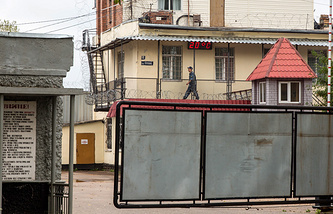 The Investigative Committee has detained two more employees of the Directorate for the Yaroslavl Region of the Federal Penitentiary Service (FPS) under the charges of using force against prisoners, the Russian Investigative Committee press service told TASS. "The investigators have found that on November 29, 2016, scheduled security procedures were carried out in correctional facility number 1 of the Directorate for the Yaroslavl Region of the Federal Penitentiary Service involving employees of correctional facility number 8. While a group of convicts was running along the corridor, the employees of the specified correctional facilities inflicted multiple blows to the convicts with their hands, legs and rubber batons," the Investigative Committee reported. Employees of correctional facility number 8 Sardor Ziyabov and Dmitry Nikitinko were detained on suspicion of committing these crimes. The investigators filed a request to place them into custody as a pre-trial restriction. Reports of tortures in the Yaroslavl correctional facility in the summer 2017 were published on the website of the Novaya Gazeta newspaper on July 20. The text was followed by 10-minute footage, which had been sent by lawyers from the Public Verdict foundation. The footage shows people dressed as FPS officers beating and insulting a man. According to the Public Verdict lawyers, it is prisoner Yevgeny Makarov. The regional Investigative Directorate of the Russian Investigative Committee launched a criminal case over abuse of authority based on media reports. On July 24, the case on the tortures was submitted to the central office of the Russian Investigative Committee. As a result 17 employees of the Yaroslavl correctional facility were removed from their positions. Zavolzhsky Court in the Yaroslavl Region arrested 11 perpetrators under the case. One of them is staying under house arrest for health reasons.